It's time again for Secret Recipe Club reveal! My secret blog assignment this month is Karen's Kitchen Stories. Karen likes to try recipes that are a bit of a challenge, and she's constantly learning new cooking techniques which she shares with her blog readers so we can all learn something new. She's especially in love with all things bread and has been known as the Bread Queen by other members of the SRC, though she considers herself more of a Bread Geek. Judging by the long list of bread recipes on her blog, I can't argue with either! There were definitely some bread recipes that caught my eye. 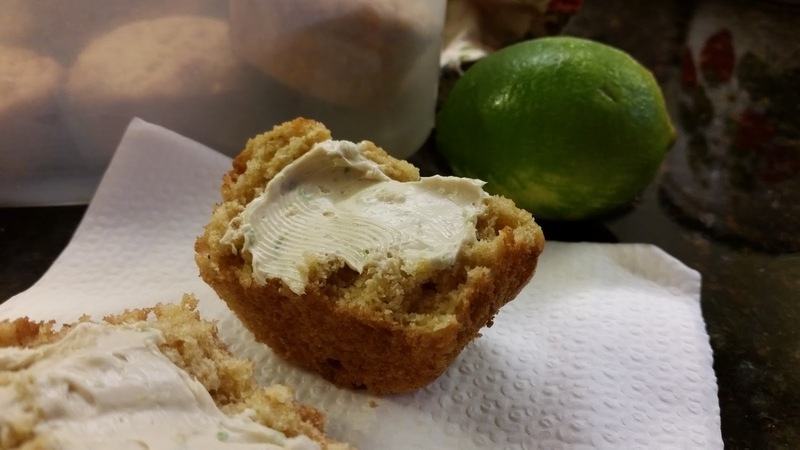 They all sound so good, but in the end I came back to the first recipe that caught my eye, these lovely Margarita Sour Cream Muffins. It's OK to have tequila for breakfast with these! Nobody disillusion me by telling me that the alcohol will bake off, all right? 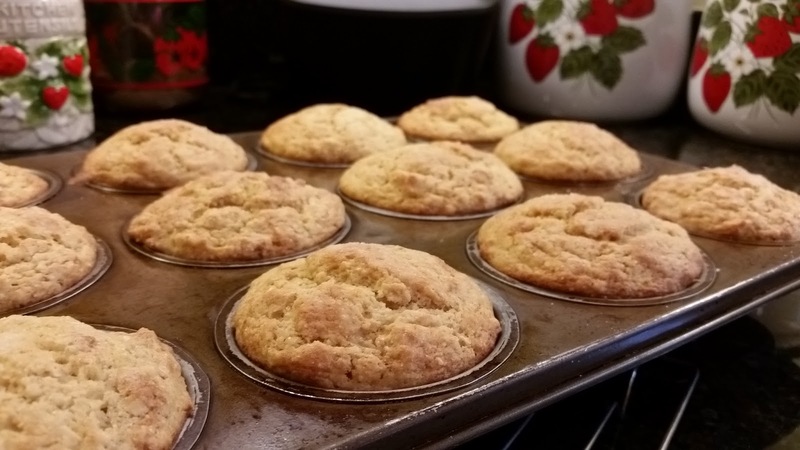 Preheat oven to 400° F. Generously grease muffin tin or line with paper liners. In a large bowl, whisk the egg, sugar, sour cream, tequila, orange juice, lime juice, lime oil, and lime zest together. Mix the flour, cornmeal, baking soda, and salt together and then stir it into the egg mixture. mixing until just combined. Pour batter into prepared muffin tin; sprinkle the tops of each muffin with a pinch of sea salt. Bake for 20-25 minutes, until browned. Cool 5 minutes before removing muffins from pan; cool completely on wire rack. These were really fun to mix up. When you stir the dry ingredients into the wet ingredients, there's a great chemical reaction between the baking soda and the citrus juices. Preheating the oven is very important because you will want to get these into the oven immediately. Next time I think I'll use more lime and orange juice and cut down on the tequila - use just enough to get the flavor. The tequila makes the muffins taste good - you really do get the flavor - but I'm back to thinking that all my alcohol is baking away, and I think I'd rather use my tequila for actual margaritas. I do love a good margarita. I've been wanting to try making my own taco seasoning for ages, but I still had some I wanted to use up, so I just hadn't gotten around to it. Then, last month when I started planning meals for Camp Outreach, I realized that there is wheat in the taco seasoning I had. Now, ordinarily I might not think a thing of it, but we had some people with gluten sensitivities who were going to be there, and I thought it best to avoid the wheat altogether in the taco meat. 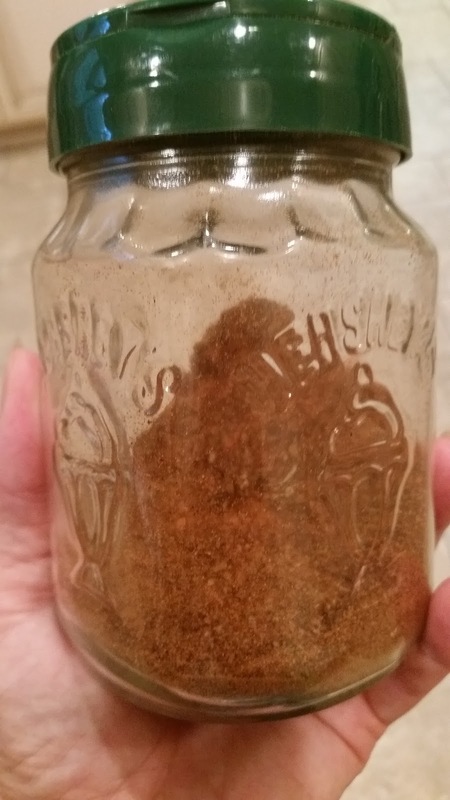 So, I finally got around to making some taco seasoning. I started looking on Pinterest and came across this recipe. It's called the 'best taco seasoning recipe ever' so I figured it ought to be good. Apparently she tried a lot of taco seasoning recipes from around the internet, and this is the one. Measure all ingredients into glass jar; cover and shake to mix well. Seriously, it's that easy - mix together spices you probably already have on hand (I had everything except usable onion powder. Why is it that onion powder always, always, always turns hard as a rock?) and you get a taco seasoning mix that is really good. I think it has a better flavor than the store bought kind - and no weird ingredients in there, either. Cherries were 98¢ per pound this week so I bought several pounds. 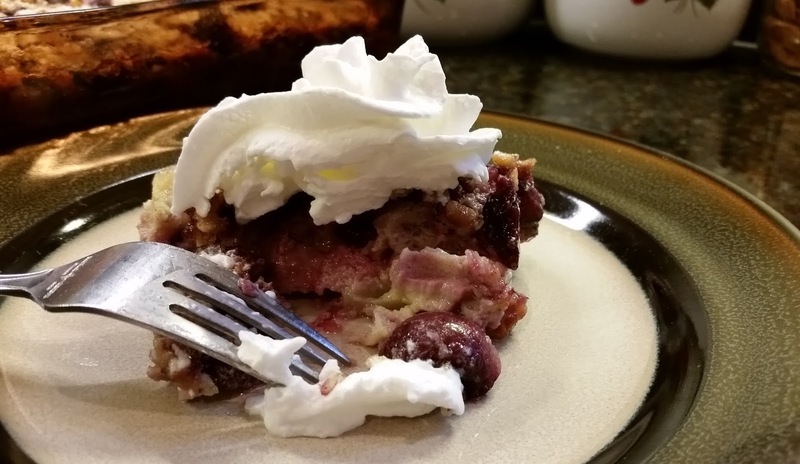 Jeffrey loves eating them, and I figured for that price I could also try out a cherry dessert I'd seen on Facebook a while back. Of course, I couldn't find the exact recipe I was thinking of, so I turned to Pinterest. This is what I found. Preheat oven to 325°. Generously butter and flour a square baking dish. 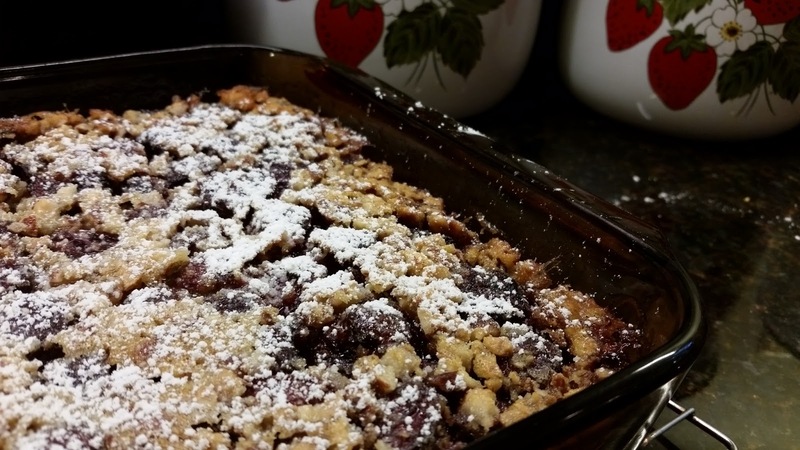 Spread cherries evenly in the bottom of prepared baking dish. In food processor, pulse almonds, flour, sugar, and salt until almonds are coarsely chopped. In large bowl, whisk eggs, milk, vanilla, and lemon zest. Add in the melted butter and flour mixture and mix well. Pour over cherries. 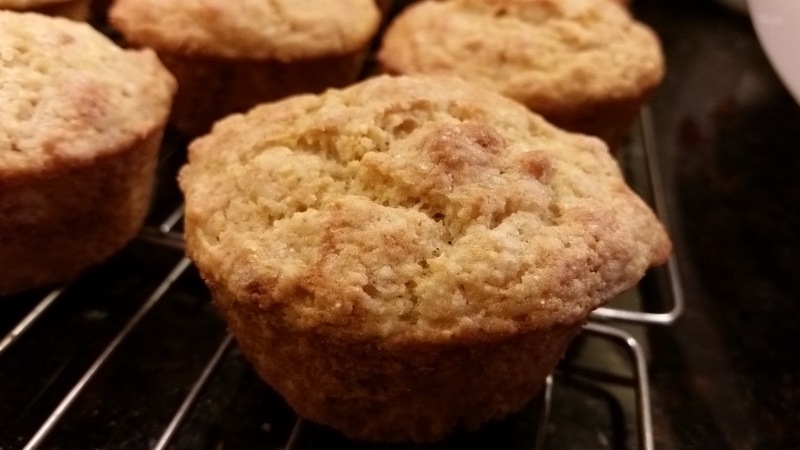 Bake in preheated oven 40-60 minutes, or until center is set and the top is golden brown. Dust with powdered sugar and serve with whipped cream. I am definitely going to have to make this again. We really liked it. BUT, it didn't turn out exactly the way I was expecting. It turned out very custardy and not at all cake-like, which I was expecting from the picture. Of course, another recipe I found looked entirely custardy - and somehow the cherries all ended up on top of the custard. How did they do that? I do want to try dusting the buttered baking dish with granulated sugar as suggested in that recipe, instead of flour. Like I said, I am going to have to make this again. 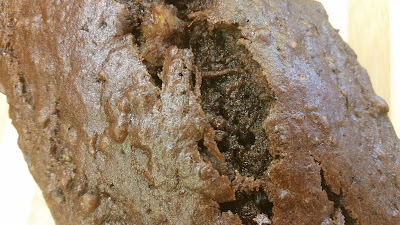 Mine took quite a bit longer to bake than the original recipe, and it seemed like there was just too much butter. Some people may think there is no such thing, but... Looking back over the recipe now, I see that I did have too much butter. The recipe called for 1/2 a stick of butter, and I read that as 1/2 cup - so I used a whole stick. That's twice as much butter as I was supposed to use! So, Next time I'll do it right and see how that works out. Other than that, the only difference in my recipe was that I used whole almonds instead of sliced ones because that was what I had, and I figured they were going to get chopped up anyway. Oh, the smell of toasted almonds! I would suggest toasting your almonds before starting on pitting your cherries, otherwise it can be quite a mess. Those cherries themselves can be quite a mess. I wore plastic gloves to avoid staining my hands with the cherry juice - but trying to slip one glove off to go check and shake the almonds while they toasted was quite a feat, and I ended up splattering some cherry juice on my face and in my hair trying to get the glove back on - without getting cherry juice inside one of the gloves. But, my hands did stay fairly clean, except for the thumb I was using to pop the pits out. Of course my thumbnail would pop a hole in the glove! Also, what size baking dish is 7x5"? Yes, I know - 7 inches by 5 inches, but what kind of dish would that be? I didn't know so just went with my square cake pan. It looks like it fit just about perfectly. The flavor of this was really good, even if I did mess it up a bit. I'm already thinking of other fruit I could use. Maybe peaches? The peaches in the store have been really good this year. Anybody else notice that? Sometimes they're just really disappointing; either they don't ripen up, or they get all mealy and yucky. But this year they're nice and sweet. 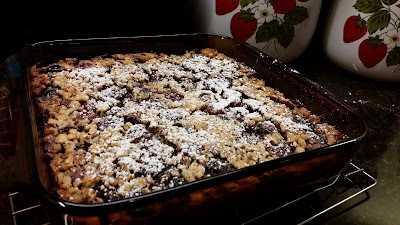 Anyway, back to the dessert - clafoutis - I'm not even sure how to pronounce it or why it's called that, but we are enjoying it, so that's all that matters. Have you made one or have a recipe I should use? Please share! It's time again for Secret Recipe Club reveal! My secret blog assignment this month is Thyme for Cooking Blog which is all about the food, and life in France. I wish, wish, wish I had more time to spend poring through this lovely blog. I want to know about restoring a French farmhouse, and I want to know how Katie, who started in Minnesota and Wisconsin, managed to end up in France - with a few other interesting stops along the way. We lived in Wisconsin for 15 years, but I do not think there's any chance we'll be ending up in France. I will most definitely be reading through Katie's posts more thoroughly whenever I find the time! I love how all her posts include not only the recipe but also an interesting story about what is going on in her life. For now, I'm glad she loves healthy food, healthy ingredients, and most of all Simple Recipes. 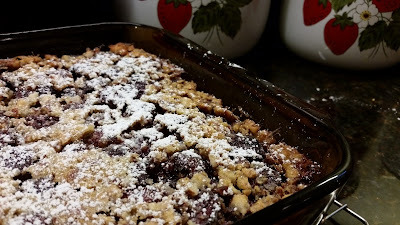 Of course, simple (but tasty) recipes are a big favorite of mine, but this month I really needed something simple. I spent a week cooking dinners for approximately 90 people at Camp Outreach, and the weeks prior to that were spent planning, shopping, and cooking chicken and taco meat in advance. If only I could have used a recipe from Thyme for Cooking Blog for camp... That would have been awesome! So, Katie, when you read this, feel free to point me to any of your recipes that may have been great camp fare. There's always next year. Maybe. This Italian Beef and Cabbage might have been good. I am definitely going to try that soon. Chicken with Red Beets and Cabbage is on my 'to make' list too, along with Beef, Cabbage, and Feta on Barley. I seem to see a cabbage theme here. 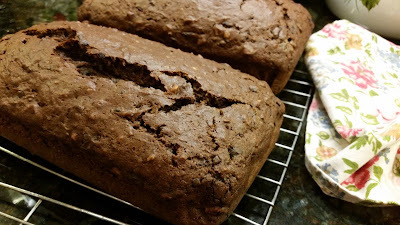 In the end I picked this Double Chocolate Zucchini Bread, because chocolate. And not only chocolate, but double chocolate. 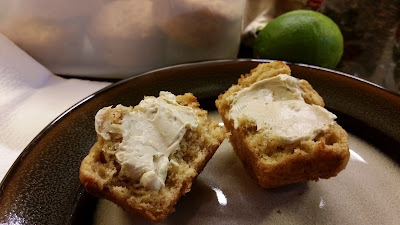 And also zucchini, and it's one of those simple recipes which I thought would be perfect to share, because, with the slightly longer 4th of July weekend, we decided to go visit my parents, and I always try to take something so Mom doesn't have to fix all the food. This Apple Bread was also a possibility, but the chocolate won out. Butter 2 large loaf pans, then line the bottom with parchment paper. Combine butter, sugars, eggs, vanilla in a large bowl and mix well. Stir in zucchini. Mix flour, cocoa, baking soda, baking powder, salt and cinnamon together; stir dry ingredients into wet ingredients and stir gently to combine. Add chocolate chunks and walnuts and stir just until combined. Divide batter between prepared loaf pans. Bake 55-60 minutes, until toothpick inserted in center comes out clean. Remove from oven and let rest for at least 5 minutes before removing from pans. Cool completely before slicing. 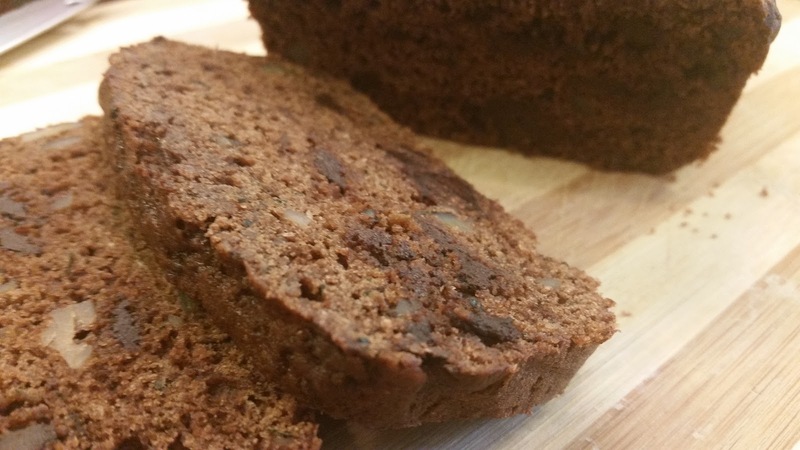 This recipe is a definite keeper. 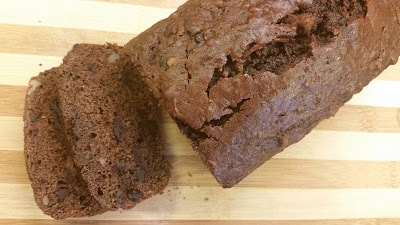 Deep, dark chocolatey, chunky and super moist. The first words that came to mind when I bit into my first piece were, "Oh, Baby." It is so good. I stored it in the refrigerator because of the moistness, and I think that made it even better. The two loaves did not last long when I put them out to be shared. It really was hard to resist grabbing just one more piece. And it didn't look like anyone was actually trying to resist. Thanks for the recipe, Katie. I will be making this again. And again. I see why you make it often.